________________________________________________________________________________ Some of you may have noticed that I incorporate words of songs into my posts - a lot - too much? lol I can't help it - for some reason it's how my brain works - it registers lyrics to almost every situation I find myself in - that and the fact that I have to have music playing when I'm doing anything at all................. It looks like that headboard I so desperately wanted to buy - was not meant to be - one thing or another kept preventing us from picking it up - ( and then someone mentionned it probably had evil spirits attached to it and that's why it was alluding me - and that's all I needed to hear - seriously :) So in searching around the house for something to actually make - or build - or paint - that I could POST about ( walking around from room to room - with one hand on my hip and the other on my chin - with my eyes darting all around ) I sadly could only find my pile of pallet wood - leaned up against my bedroom closet, and not one to pass up any opportunity - I seized the moment - dragged John off the bed and had him help me out a little. Suzan says - John could you help me out with something in the kitchen John says - Sure Sorry - everyone - John was extremely agreeable to EVERYTHING I asked him tonight - not quite sure why yet - but it's makes for a boring post I know. Here Danni - I added a cupid in Pic Monkey just for you - stop bugging me about Valentine's Day projects now!!! even when you think you have no food in the house - you can always make soup, right? hmmm - I may have to paint the ram's head next...................in the meantime wouldn't this make a great headboard? 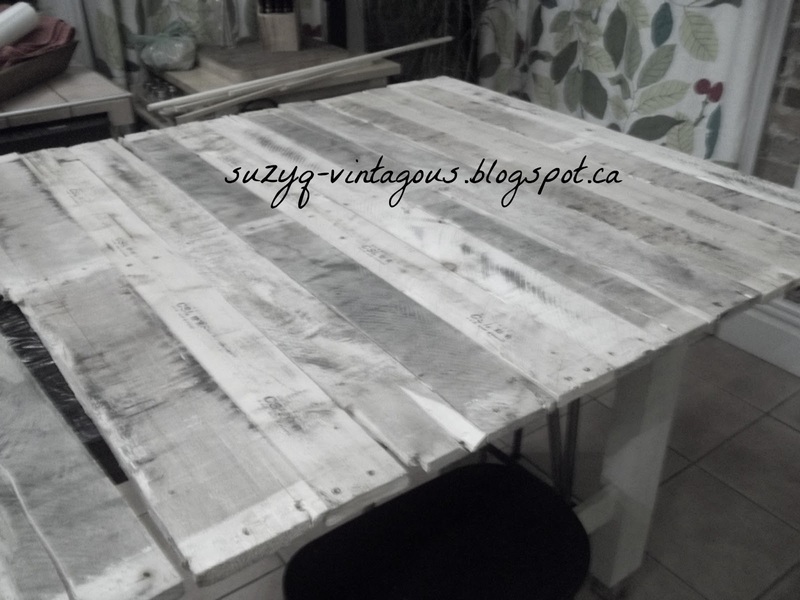 isn't pallet wood just the best for rustic anything? Thanks so much Suzan! Hope the wedding was all your daughter wanted it to be! Guys, I'm back now, but my sister is visiting and we spent practically all of today editing pictures from my trip. I've got lots of checking up to do! Thanks for being welcoming to my guests. I'll be back on the blog soon with lots of stuff to show you! Have a great weekend and I hope you've been making wonderful things! Love it! Hope the wedding was everything your daughter hoped it would be, Suzan! Suzan...you over think things!! Your post is funny and your project is great! Hope you're recuperating! Welcome Back Karen! Suzan hope you are recovering! Can't wait to hear about the wedding! That is a great project for a wedding or a headboard or a wall or a garden sign. Fabulous! From one over-thinker to another! Love Suzan's sign and of course her conversations with herself and with John. Still love this sign, Suzan! I can't wait to see the pics of the wedding. Karen, glad you are home from your trip and looking forward to the tales of your adventures. Oh Lord. Just found you. I've followed some fabulous blogs, but I think you and I might have been soul mates in another life (or perhaps even in this one?). I'll be retiring in a couple of years and just purchased a house in a gated lake front community at an unbelievable price- one I could never have afforded in a normal real estate market. It had been on and off the market since 2009, and no one else wanted it simply because it has a HUGE room (1,400 sf) in the back that once housed an indoor pool (which has now been covered with a floor). I guess no one else could see the potential. But I took one look and immediately saw "STUDIO!" The realtor tried to talk me out of it, and laughed (nervously) when I told him what I wanted to offer. He said, "I know this Seller. He'll never go for it. In fact, you'll insult him." BUT, when I got it for HALF the asking price he changed his tune and became almost excited as I was! I can't wait to start filling that room with "quirky" creations of my own that have been swimming around in my head for years just itching to get out. Your blog will inspire me even more to turn out fun, unpredictable creations! Sorry for the long post, but I'm just that excited to find you. Thanks! !